There are no such things as protective shields and extra lives in PikPok's newest iPhone and iPad creation, Into the Dead. One wrong move through this first-person runner is all it takes to become a late night snack for a brain-chewing zombie. Of course, it doesn't have to be this way. 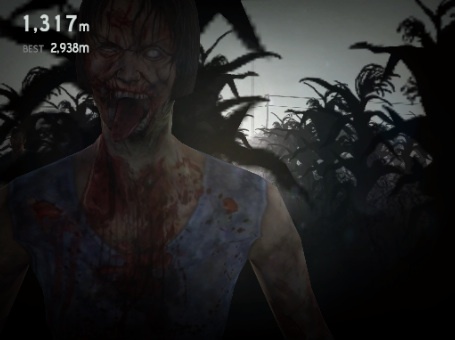 You can survive for long stretches so long as you follow our Into the Dead cheats and tips guide. When you first spot a bunch of zombies, it'll appear the undead are right next to each other, but this is rarely the case. More often than not, there will be a few feet between the flesh eating freaks, so it's in your best interest to figure out how you want to approach any given situation well beforehand. Will you dash right? Will you dash left? Is there enough space to squeeze between two zombies without getting caught? These are the sorts of questions you'll need to ask yourself, and you better have answers. Tip: Your character auto jumps, but can stumble over objects. You'll also bounce off trees if you get too close. Interested in using weapons to your advantage? If so, make sure you run through crates and crosses, highlighted in green and yellow, respectively. Doing the former equips you with a random weapon, while the latter equips the one previously used. Tip: Always know how much ammo is left. Let's face it, one bad decision and you're dead. If there's a crate all the way on the right and you're far left, let it go. The whole idea is to keep running, so stick with that until a better opportunity presents itself. Tip: Conserve ammo whenever possible You'll need it later. -Armed Start: Start with a weapon. -Head Start: Start from 1,500 meters. -Ammo Boost: Fifty percent more ammo. -More Crates: More weapon crates. Tip: The game keeps selected perks highlighted until a.) you run out of coins, or b.) you deselect them. It's better to brave the zombie horde with a firearm. That said, don't be stingy with gold coins. You must meet certain in-game achievements to beat missions. These range from using two perks in one run to reaching 250 meters. Naturally, objectives grow more complicated the further you progress, but this is the only way you'll unlock weapons, outside of spending 130,000 Coins to fast unlock everything. You'll see the current list of achievements after finishing a run. Tired of getting ripped to pieces for only a couple hundred coins at a time? Purchase as many as you want, for a price. Tip: You'll earn 100 Coins for recommending the game to friends via Facebook, but we were unable to make this work.